Time trials provide a venue for SCCA members and other sports car enthusiasts who wish to experience higher speeds than the Solo program allows in a timed competition and/or for whom the Club Racing program is not currently an option. Club Trials (level 2) allow street and race-prepared cars to compete in Solo (and other) classes on a race track. Speeds are unlimited, but passing is strictly controlled, restricted to straights. 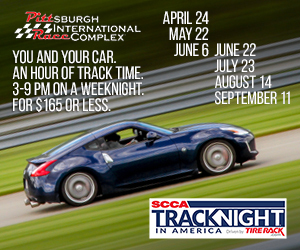 The Steel Cities Region typically runs Club Trials on the North Track at the Pittsburgh International Race Complex. Track Trials (level 3) allow race-prepared cars (including Solo Street Prepared and Street Modified) to compete on a race track. More safety equipment is required than a Club Trial, such as roll bars/cages, harnesses, drivers suits, etc. as defined in the Time Trial Rules. In addition to SCCA membership, a Time Trial or Novice Time Trial permit is required. Hill Climbs (level 4) are similar to Track Trials with the exception of the venue. Hill Climb events are run on paved mountain roads over short distances. The Steel Cities Region runs both Track Trials and Hill Climbs in association with the Pennsylvania Hillclimb Association. The annual events that the Steel Cities Region hosts are Polish Mountain in early August in Flintstone Maryland and Fall Jefferson over Labor Day weekend at Summit Point, WV (see Time Trial Schedule).